FitLit: The Complete Beck Diet for Life and a Giveaway! It’s no secret that Erin and I aren’t a fan of “diets” in the starve-yourself-for-weeks sense. 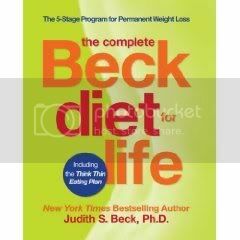 But, after reading The Complete Beck Diet for Life: The Five-Stage Program for Permanent Weight Loss (let’s just call it the “Beck Diet” from here on out, okay? ), I have been shown that sometimes diet isn’t a four-letter word. Well, I guess technically, it’s always a four-letter word, but it’s more of the “g-o-o-d” variety than other choice selections, for sure. The Beck Diet is a full-out five-step program and is completely refreshing. As someone who once read diet fad books as a hobby, I wanted to scoop this one up, save it and hand it out like a weight-loss gospel. Unlike other diet plans that touch on emotional eating as a side note, this one starts the weight-loss process at the head. Dr. Beck doesn’t just tell you to stay strong and motivated to choose healthy foods and behaviors, either. The book shows you how to create a system of note cards that highlight your own personal strategies for challenging situations and moments of healthy living triumphs for you to reflect back on when your weight-loss drive is waning. The book is also chock full of good tips and reality checks. Dr. Beck addresses the anxiety around your eating habits and really tries to get you to focus, reduce distractions and enjoy your food. I read the book a chapter at a time, and each time I put the book down, I had something new to chew on. The big take-home message, for me, was that you have to relearn how to really eat and think. And once you build your confidence and have a plan, you’re on your way to eating well for life. The only things that I wasn’t crazy about in the book is the attention to calorie counts and how much of the plan is built solely on willpower, which kinda-sorta rubs me the wrong way as I’m more of an intuitive/listen-to-your-body eater. And I’m on the fence about her strictly planned meals and snacks, where she actually wants you to feel your hunger because then you’ll learn that hunger really isn’t so scary. (Why do I have a feeling that this will spark some serious discussion…I get Dr. Beck’s point that those who overeat are usually out of touch with their hunger and need to feel hunger again to get a hold of it, but it seems like this could encourage problems at the other end of the eating spectrum. Feel free to discuss below.) On the upside though, the plan is no quick fix and doesn’t ever vow to be. Slow and steady wins the race after all. For more healthy reads, check out The Gym Survival Guideand an entire book dedicated to dessert! From someone else who used to read diet books as a hobby, I’d be really interested to read this book and see how it compares to what else I’ve read. I feel like no matter what your weight loss goal, whether it’s to lose 50 pounds or just maintain, these books can provide some interesting choices we hadn’t even thought of before. Would love to win this book. I’ve heard tons about it and it’d be nice to get my hands on it and see what all the fuss is about! I would like to win this book because ever since getting diagnosed with cancer at the age of 23 (last year), I’ve been doing my best to be as healthy as possible. After I’m done reading it and learning all I can from Beck, I will donate it to my local library so that I can pass the knowledge on to many more people, even those who can’t afford to buy diet books for themselves. I am in love with exercise (most of the time). I spin, I kick, I lift. I even pretend that I’m G.I. Jane while running fast on the treadmill (It really helps get you through a fast 5k). I like to workout because it empowers me. After a hard workout, I feel sweaty (stinky) and strong! My fitness troubles, therefore, begin and end with food. Most of the time, I’m super healthy, noshing on whole grains, oodles of fruits and veggies, and lean protein. But other times (like, when I’m sad, mad, bored or anxious), I can’t stop putting food in my mouth. Ultimately, I want as healthy a relationship with food as I have with exercise. I want to feel empowered when I make food choices. I want to feel in control. My hope is that this book could help bring some of that balance to my life. When I’m hungry, I scare everyone else around me, that’s for sure. (No smiley face because it really. isn’t. funny.) I’m still LOVING the pilates DVD I won awhile back (my review finally coming up…SOON) so I hope someone else will get to enjoy this book. Happy weekend! First of all, let me say that I enjoy your blog. Actually, it ROCKS! Second, as a 43-year old who has been fighting weight all my life, I’m am trying to find a permanent weight-loss method and healthy way of living. Maybe the secret is in this book? Regardless if I win, I’m going to keep eating less and moving more. And your reviews are a great help. Doing some of the DVDs you reviewed now…. Keep it up! I’d like to win the book because I am anti-diet. I don’t believe they work because they are usually gimicky. I believe eating healthy and exercise are the only way to go. Now I want to see if this “diet” can change my mind. I’d love to win it! I always like to read more about how to improve my health and fitness. I think I’ve read most of the other diet books out there. I too would like to read this to compare and see the differences. Lent is here, and this book would be a great motivator for keeping up with my promises to cut out junk and “on the go” eating! I’m always on the look out for a good, quality diet type book. Always good to see what new/different information is out there and hope that the plan works for me! atefecke — word verification sounds vaguely critical here. Why are they criticizing what I eat? I’ve heard so much about this book. I’d love to read it and see what it’s about! Have heard lots about this book and I’m really intrigued by it. Will have to check it out for sure. I think you’ve got a good point about the possibility of going to the other end of the spectrum too- the advice to feel the hunger could work really really well for some people and could totally backfire for others. I’ve heard a lot about this book. I’d love to check it out and see what all the fuss is about. I am always trying to develop a better relationship with food – especially after having a very bad one for so many years. I’ve lost over 70 pounds and am forever trying to improve my eating to stay slim and keep getting healthier. From reviews the book sounds solid! I love how it promotes reducing anxiety about foods, etc that so many struggle with! Thanks for this review. I tend to read fad books as a hobby as well. I find that I can usually pull out at least some positive tip even if I don’t agree with everything. I’ve grown away from the calorie counting over the years. It makes eating feel like such an obsession when I do this. I like your comment ‘listen-to-your-body eater’. This is my prefered healthy eating method. I agree that the experiencing hunger issue could go both ways depending on the person and health history. I would love to win this book so that I could learn a little more method to the whole diet thing. I got married last June and have been reorienting my new life with husband to keep healthy. The “Beck” diet plan book sounds interesting. I like the idea that it incorporates the psychology behind over eating and not just how to modify or change a person’s eating habits. I would love to win this book! The book/plan seems well rounded. I’d like to see what this dietician has to say about calories and sugar and fat. I definitely have problems with emotional eating. Anytime I’m stressed or sad or bored, I find myself grabbing for a sweet treat even though I KNOW I don’t need it. I’d love to get some ideas and an action plan on how I can stop this from happening (or at least try to stop it!). OMG! This sounds like the perfect book for my dad and I would love to be able to give it to him! He really needs to lose weight and nothing seems to be working! I think he needs some of those “reality checks”! I want him to walk me down the aisle one day……and I want to make sure I do everything I can to get him there! Thanks for the opportunity! I’m reading this book and following along on my blog: http://beckdietdailies.blogspot.com (not in my profile). I cannot recommend this book enough! It’s been the KEY for me to get my head in the game. I know how to count calories and points all the livelong day. What I do not know how to do is STAY ON a diet. Re: the feeling hunger issue, this was also key for me to learn. Before I started practicing the skills in this book, I would panic if I even THOUGHT I might get hungry. Hunger was something to be feared and avoided at all costs. Since learning the skills, I know now that 1. I often mistake true hunger for a desire to eat. and 2. hunger is not an emergency. I am still looking for that book that just hits home. Besides I vow to one day win one of your awesome giveaways! Thanks for doing the research for us! As a bit of a weight loss tortoise myself, I was intrigued by your comment about how this book promotes the “slow and steady wins the race” approach. I’m also a therapist in training, so anything that examines the emotional root of behavior is alright by me. I heard a lot about this book and it’s been checked out at my library forever. Definitely would like a copy! If I’m hungry I am not plesant to be around. I’d like to read this book and find out how to not have hungry be scary. I was going to try and leave a witty post in the hopes of catching your eyes, but then I read others’ posts and I realized that I just need to be honest. I have fought the weight battle my entire 31 years. I was even in “remedial gym” as a child because of poor performance on a fitness test. Like you guys, I am a HUGE Biggest Loser fan and in January I purchased a BodyBugg and my world is changing. (My BodyBugg is lovingly named Bob after trainer Bob on TBL – and I’m not just saying that in order to win a book; I have friends that can attest to it.) Since purchasing Bob, I now have an understanding of the relationship between what I eat and how many calories I burn. From your review, it sounds like this book would be the perfect compliment to Bob (my BodyBugg) in terms of not only the eating plan, but especially with regards to conquering the mental aspect of weightloss. I’ve had issues with the emotional side of eating for years. I’ve tried multiple diets and even tried some dangerous eating habits. I’d love a chance to look at eating from a new and healthy perspective. I’d love to read this — I’m doing pretty well on my own weight loss journey, but my best friend is really struggling. It’d be nice to learn more to help her too, since she looks to me for advice. I read the first Beck book, but just didn’t follow through with the plan. This one, being more prescribed, seems like it would be an awesome fit. I’m eager to try it! I really need to lose weight to feel good about myself.